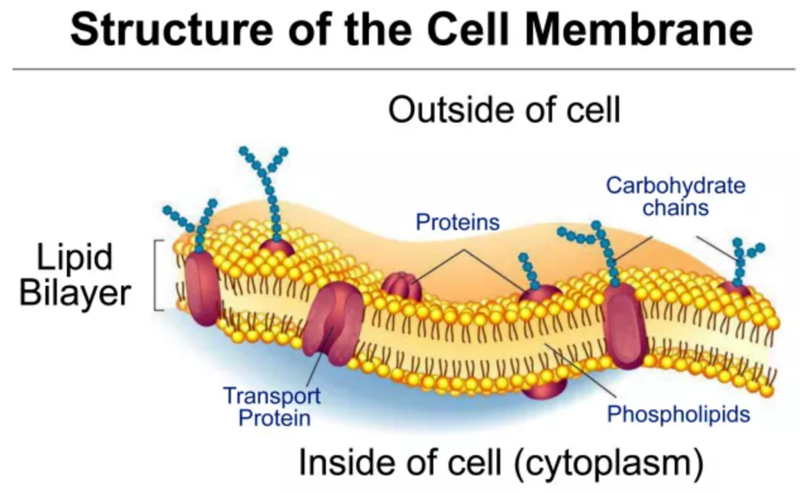 The human cell membrane separates the interior of all cells from the outside environment of the cell called the extracellular matrix. The fundamental building blocks of all cell membranes are phospholipids. 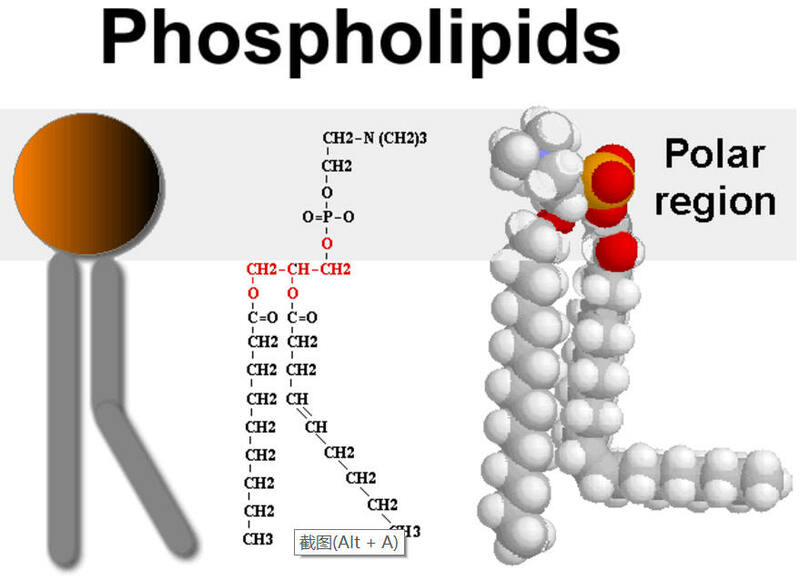 Phospholipids are a class of lipids that are a major component of all cell membranes. They can form lipid bilayers because of their amphiphilic characteristic. The structure of the phospholipid molecule generally consists of two hydrophobic fatty acid “tails” and a hydrophilic “head”, joined together by a glycerol molecule. About 50% of the mass of most cell membranes are composed of phospholipids. Lecithin contains a balanced amount of phospholipids and glycolipids. Lecithin consists of phospholipids such as phosphatidylcholine, phosphatidylethanolamine, phosphatidylinositol, Phosphatidic acid, other minor phospholipids and glycolipids. 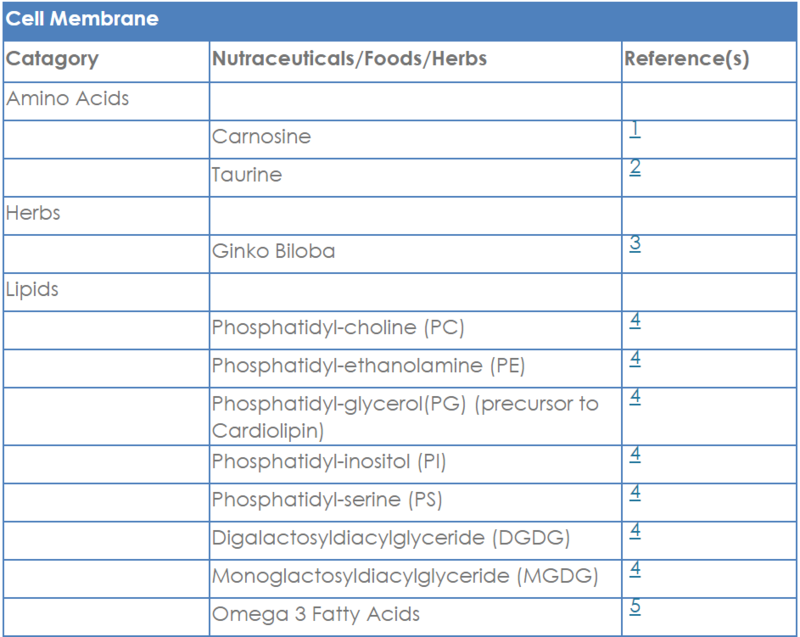 The substances in the Table below have been researched for their ability to maintain and repair the cell membrane. A mitochondrion contains outer and inner membranes composed of phospholipid bilayers and proteins. The inner mitochondrial membrane can be subject to oxidative damage due to the presence of a very oxidation-sensitive phospholipid named Cardiolipin which represents 20% of the total lipid composition of the inner mitochondrial membrane. Cardiolipin is functionally required for the electron transport system, and it is synthesized inside the mitochondria from two phosphatidylglyerol molecules. The inner mitochondrial membrane can become damaged and altered due to an increasingly “leaky” membrane. This is caused when Cardiolipin is damaged by oxidation. Once the Cardiolipin in the inner mitochondrial membrane becomes oxidized, the membrane become compromised and no longer form a tight ionic/electrical “seal” or barrier. With the loss of this ionic/electrical barrier the mitochondria losses electron transport and cellular energy. Ultimately this could result in cell death. The substances in the Table below have been researched for their ability to enhance the function of Cardiolipin. [i] Nicolson GL, Ellithrope R. Lipid replacement and antioxidant nutritional therapy for restoring mitochondrial function and reducing fatigue in chronic fatigue syndrome and other fatiguing illnesses. J. Chronic Fatigue Syndr. 2006;13(1): 57-68. Ellithorpe RA, Settineri R, Mitchell CA, Jacques B, Ellithorpe E, Nicolson GL. Lipid replacement therapy drink containing a glycophospholipid formulation rapidly and significantly reduces fatigue while improving energy and mental clarity. Funct Food Health Dis. 2011;1(8): 245-254. Nicolson GL, Ellithorpe R, Ayson-Mitchell C, Jacques B, Settineri R. Lipid Replacement Therapy with a Glycophospholipid-Antioxidant-Vitamin Formulation Significantly Reduces Fatigue Within One Week. J Am Nutraceut Assoc. 2010;13(1):10-14. Piper BF, Dibble SL, Dodd MJ, Weiss MC, Slaughter RE, Paul SM. The revised Piper Fatigue Scale: psychometric evaluation in women with breast cancer. Oncol Nurs Forum. 1998;25(4):677-684. Agadjanyan M, Vasilevko V, Ghochikyan A, Berns P, Kesslak P, Settineri R, Nicolson GL. Nutritional supplement (NTFactor) restores mitochondrial function and reduces moderately severe fatigue in aged subjects. J Chronic Fatigue Syndr 2003;11(3):23-26.